Previous studies by the Pew Internet & American Life Project found that a home high-speed internet connection draws people deeper into internet use, and the data from our December 2005 survey add further weight to this finding. Half of online users (53%) say they spend more time online since getting a high-speed internet connection at home, while 40% say the amount of time they spend online has not changed since getting broadband (6% say they spend less time online). The “time effect” shows up when broadband and dial-up users are asked to estimate the amount of time they spent online “yesterday.” The upper-end choices for the time estimates are between “two and three hours,” between “three and four hours,” and more than four hours.” For broadband users, 43% say that, on the typical day, they spend more than two hours on the internet – 18% say they spend more than four hours. For dial-up users, 33% say they spend more than two hours online on the typical day and 10% say the spend upward of four hours online. These differences – identified by asking people what they did “yesterday” – are compounded because dial-up and broadband users go online “yesterday” at very different rates. Among home dial-up users, 56% go online on the typical day, in contrast to the 77% of broadband users who say they get online on the typical day. When more broadband than dial-up users say they spend more than four hours online on the typical day in the percentage terms noted above, that difference does not take into account that a broadband is more likely than a dial-up user to go online to begin with on the average day. The December 2005 survey probed two dimensions of how broadband users’ increased engagement with the internet might play out: posting content to the internet and use of the emerging interactive voice online application – voice over internet protocol (VoIP) phone calling. Forty-eight million American adults have posted content to the internet. Overall, 35% of internet users posted online content that fall into one of the categories listed below; that comes to 48 million American adults. Since most of the content items are of a personal nature, the table below focuses mainly on content creation among adult internet users with access at home, although the first column reports results from all internet users asked the questions. Most (89%) internet users have access at home and the same share of user-generated content originates from online users with home access. Broadband users, not surprisingly, are more partial to putting content online than dial-up users, with 42% of broadband users having done that versus 27% of dial-up users. In other words, among home online users who have posted content to the internet, 73% have broadband; that is about 31 million adults. In looking across the different kinds of user-generated content that we probed, there is an element of the internet being the medium for creativity and the internet being an outlet for creativity people bring to worldwide web. Blogging and, perhaps to a somewhat lesser extent, maintaining one’s own web page, are creative undertakings that take place mainly at the keyboard. For the 36 million Americans who share their own creations online, several of the topics we queried, such as artwork, photos, or videos, start offline, and then people use the internet as a tool of distribution. There is a significant statistical association between creating online content and having a home broadband connection. With home broadband users accounting for 73% of those who post content to the internet, it is worth noting that 62% of home internet users have high-speed internet connections at home. This means that people with broadband connections account for more than their fair share of content postings to the internet. Some of this may be due to who broadband users are – more likely to be young and therefore more accustomed to expressing themselves using the internet. It is conceivable that some people subscribe to broadband because they want to share their creations online. Finally, the availability of the high-speed connection might draw some users to posting things to the internet. Whatever the root causes, there is a significant statistical association between having a home broadband connection and users’ putting content online. When the Pew Internet Project, in our January 2002 callback survey of home high-speed users, first asked users whether they post content online, we asked a broad question about whether respondents had posted any content to the internet, such as Web pages. At that time, 16% of broadband users said they had done this. Most of this user-generated content (80%) came from a group of broadband users we termed the “broadband elite.” Demographically, the broadband elite fits a classic early adopter profile for technology users – heavily male, well educated, and comfortable financially.10 This was at a time when roughly 10% of American adults had high-speed connections at home. Today, with 42% of Americans with having home high-speed, user-generated content is much less the realm of only a certain class of home broadband users. Online men are still more likely to post content online than women – by a 37% to 32% margin for all internet users and a narrower 43% to 39% gap for broadband users. When focusing on sharing a personal creation online (e.g., artwork, photos, stories, or videos), 34% of men have done this versus 29% of women. However, when looking across income levels, there is an even distribution of user-generated content. For home broadband users in the lower portion of those who report household income figures to us, fully 46% of respondents in broadband households in the “under $50,000” income range have put some sort of content on the internet. 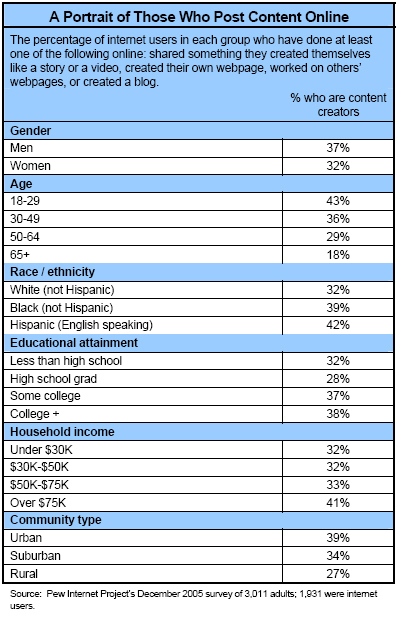 Some 37% of these respondents have shared a personal creation online and 13% have their own blogs. For respondents with home high-speed who report household incomes of more than $50,000 per year, 41% say they have posted some sort of content online, 10% have their own blogs, and 32% have shared online content they have created. Finally, recall that many respondents do not tell us their household income. Among home broadband users in this group, 36% have been the source of user-generated online content. Young internet users – especially those with broadband at home – are the most likely contributors of content to cyberspace. Age, however, remains a distinguishing feature among those who put things online and have high-speed at home. For broadband users under the age of 30, 51% have placed content on the internet, 25% have their own blogs, and 41% have posted online a bit of content they created themselves. For those over 30 with high-speed at home, 36% have been a source of online content, 6% have their own blogs, and 28% have posted any sort of creative work to the internet. Some user-generated content posting happens at work – some of it personal in nature. Many Americans – 30% to be precise – have internet access at home and in the workplace and 8% have access exclusively from work, with another 3% having access only from a place other than home or work. It is quite possible that some “content management” activity goes on when people use the internet at work or elsewhere, although our survey did not ask respondents where they do their online content activities. Some internet users take time out of the work day to update their personal webpage or blog. When focusing on users whose only internet access is in the workplace – an admittedly small sample of 148 users – we find that there is personal content creation going on in the workplace. One in five (21%) of these “work only” users have posted content of some sort to the internet, with 8% saying they have their own online journal or blog. When adding the 3% of internet users who have online access exclusively from a place other than home or work, the sample size increases to 216 and the results stay the same. 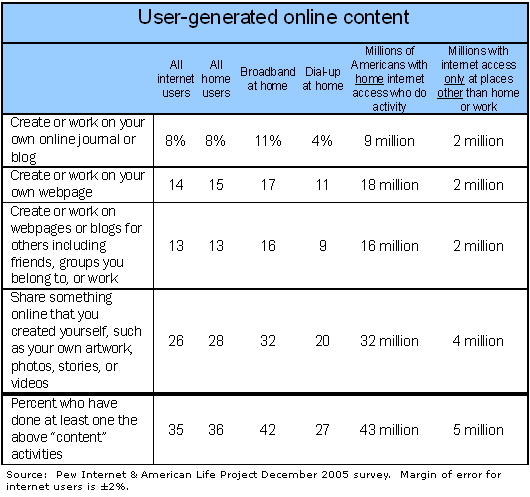 The Pew Internet Project last asked about user-generated content in April 2003, and we asked about it in greater detail then than in our December 2005 survey. In 2003, the survey prompted users about twelve different topics related to posting content to the internet. This yielded the finding that 44% of internet users had been the source of online content.11 The twelve topics included all the elements listed in the four online content questions listed in the table on page 11, although several items, such as posting artwork or audio files, were broken out as separate questions. A few online content activities asked about in 2003, such as posting comments to online newsgroups, were not included in our December 2005 survey. The differences in the 2003 and 2005 survey questions on content creation make it impossible to compare our overall numbers for user-generated content over this time interval. The questions were asked differently, and the long list of content activities in 2003 likely had the effect of increasing the share of online users who said they had ever posted content to the internet. Such a lengthy list tends to jog people’s memories about activities they may have done. It is nonetheless notable that user-generated creation was heavily dominated by broadband users in 2003 – at about the same rate as in 2005. In 2003, broadband users accounted for 34% of those posting content to the internet, at a time when 32% of home internet users logged on via high-speed. Home high-speed users accounted for 73% of those involved with user-generated content in 2005 against their 62% share among home internet users.12 The balanced growth in broadband penetration and user-generated content among broadband users is further evidence that posting content to the internet is not just a phenomenon limited to early internet adopters. Awareness of VoIP and internet phone calling is growing. The December 2005 survey shows that 13% of internet users say they have made a phone call online, a slight percentage increase since we last asked the question in February 2004 when 11% of internet users said they had. With the growth in online penetration over that time period, that translates into 18 millions of Americans saying they have made a phone call online, up from 14 million in February 2004. In February 2004, 27% of internet users said they had heard of VoIP – a number that increased to 45% in our December 2005 survey. Translated into millions of Americans, roughly 33 million Americans said they had heard of VoIP in 2004, a number that increased to 61 million by December 2005. This means that awareness of VoIP has grown by 86% in the 22 months since February 2004. As to use in the home, VoIP had not penetrated the consumer market to any great degree when we first asked about it in 2004. By December 2005, there is the beginning of adoption of VoIP service in the home – 3% of all adult internet users say they have some sort of VoIP service at home. Using only those who have say they have heard of VoIP as a frame of reference for this number, 6% of these respondents have VoIP service at home. About half of those VoIP users have the service in addition to regular landline telephone service and about half have it instead of landline service at home. In our report “Online News,”13 which was based on the same December 2005 data detailed here, we identified a group of “high-powered” home broadband users as a special subset of the internet population. These are ardent internet users, willing to try new things, and usually active in providing feedback to industry and technologists about what they think of novel products. One would expect that this group – which comes to 40% of broadband users and 21% of all internet users – would be open to trying something such as VoIP. Indeed they are. Fully 10% of high-powered users have a VoIP service at home – that amounts to half of all home VoIP users.